Kenya Simbas came from behind to force a 19-19 draw with Hong Kong in a test match on Sunday, August 20, 2017 at RFUEA grounds. Both Kenya and Hong Kong ran in similar three tries and two conversions each to mince the stalemate, but it was Kenya's final boot that evened out the game. Skipper George Nyambua, Alex Olaba and Dennis Muhanji scored for Kenya as fly-half Kenny Andola sent in the two kicks with one going wide. Jack Parfitt, Sam Purvis and Liam Slatem crossed over for Hong Kong as Matt Roslee missed only one conversion. The two sides will meet again in a week’s time at RFUEA grounds for the second and final test. Hong Kong started the game losing Jamie Tsang to 10 minutes for head injury assessment while Kenya suffered a blow as fly-half Biko Adema was ruled out with an ankle injury to be replaced by Kenny Andola. Hong Kong won a scrum with fly-half Roslee getting a good kick for an attacking line-out that bore the first try courtesy of Parfitt with Roslee adding the extras. 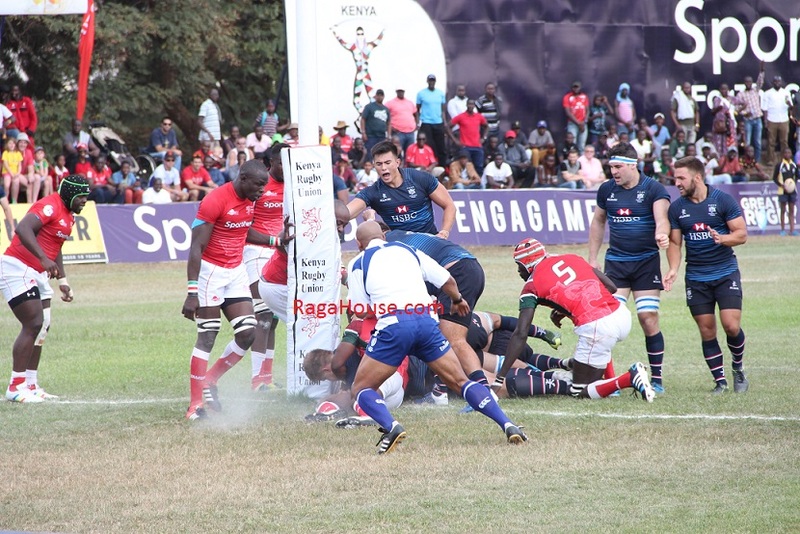 The visitors were at it again as Purvis doubled the lead but Kenya pulled one back through Nyambua who scored in between the posts for Andola to have an easy conversion. Andola had a drop-kick attempt but it went wide leading to Hong Kong gaining possession back. Kenya’s Patrice Agunda would be sent to the bin for tapping the ball even although Hong Kong’s attempt at goal went wide. Strathmore’s Alex Olaba scored Kenya’s second try but Andola could not convert for a 14-12 score at the interval to Hong Kong. Half-time change saw scrum-half Samson Onsomu replace Lyle Asiligwa while Oscar Sorano came in for James Kubasu. Hong Kong’s Liam Slatem added third try but the conversion hit post for a 19-12 lead. Andola had a chance to reduce the deficit with a penalty but he sent his kick wide. Kenya coach Dominique Habimana brought in Peter Karia, Bram Mayaka, Steve Otieno and Ronnie Mwenesi for Philip Ikambili, Dennis Karani, Edwin Machanje and Emmanuel Mavala with the changes having an immediate impact. Dennis Muhanji bagged Kenya’s third try with Andola finally getting his touch back to add the extras and bring Kenya level.